I was still deeply in love with The Phantom of the Opera ( the Leroux novel, and the musical, and Susan Kay’s “sequel” Phantom) at the time, so I was first drawn to the Twisted Man, up in the corner. He was so…brooding. And creepy. I also loved the rest of the cover, with its classic fairy-tale illustration style. My mom bought it for me, and I was ready to read. I loved this book when I first read it, and I love it still. It’s been added to my bedside reading pile, because it is due for a re-reading soon. Does anyone else do that? Re-read books? It’s like visiting an old friend, and if the book is good enough, deep enough, and rich enough, you find new things to uncover with every reading. Also, you’re coming at it from a different age, a different physical and mental space, so different elements will jump out at you than before. This book is a fairy-tale in the vein of A Princess Bride, and has been compared to that title often. The tale is very self-aware, and plays on fairy-tale conceits with skill. As a child, Prince Amatus drank some of the wine of the Gods, and thereafter was only half a man–literally*: half of his body suddenly disappears. A “year and a day” later, the Prince is joined by four mysterious companions who will prove to be the key to his fate and the restoration of his missing half. Before he can be restored, he and his companions will have to save innocent maidens, befriend mythical beasts, and uncover frightening truths that might better stay uncovered. Enough with my crap-tastic summary. I can’t say enough good things about this book. Barnes is an author known for his hard science fiction, or so the internet tells me–I haven’t actually read any of it–and recently his book Tales from the Madman Underground was selected as a Printz honor book, which goes to show you that he is a versatile and well-respected author. If you’re a fantasy fan, or a fan of sly humor and malapropisms (there’s a character named Pell Grant for f’s sake! 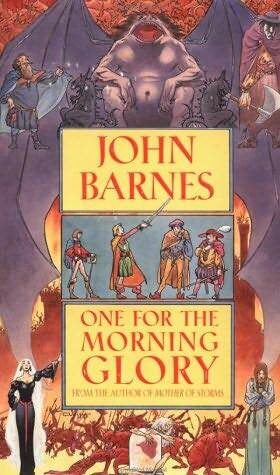 ), or a fan of rich, lovely books, please do yourself a favor and find a copy of One for The Morning Glory by John Barnes. Recommended if you like: The Prydain Chronicles, The Princess Bride, the Narnia books. It was reviewed on a Fantasy Friday Review over at Literary Transgressions. Review of the book and a little bio of Barnes from SFSite. Steely Pips wrote about it on his book log. who’re you calling an oxymoron? This sounds like exactly my kind of book. The library I work at doesn’t have it, the library I live near doesn’t have it … because of you I just impulse bought this book. Thank goodness for Amazon used marketplace! Excellent! You’ll have to let me know what you think of it. I just re-read it this month. I love it more than ever. Oh yeah, I reread. It’s the best way to be transported into the past–to feel the same thing over again. Books are never the same the second (third, fourth…) time, especially for a fast reader like me.